The Sunday before Advent is "Stir Up Sunday". 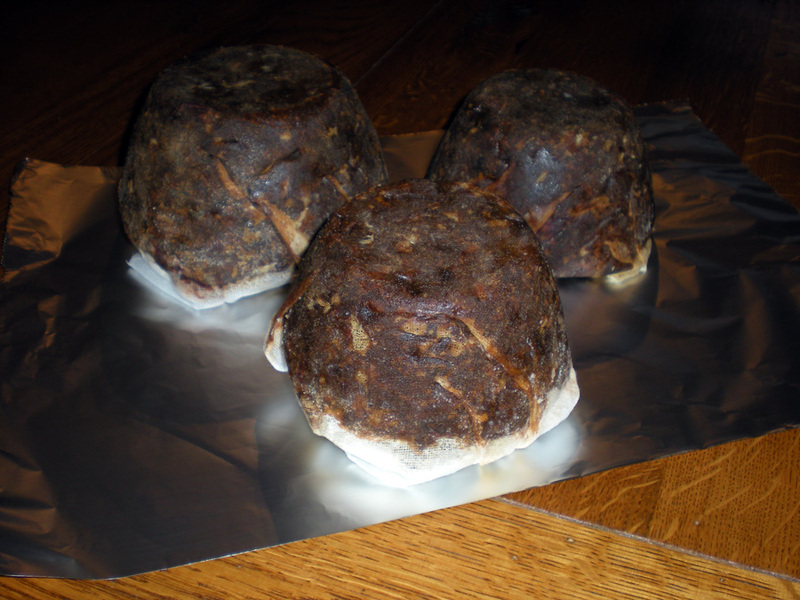 and is the day when traditionally, the family makes their Christmas Puddings. Personally, I prefer to make mine rather earlier than this. Whilst they are not difficult to make, there is a certain amount of logistics involved. It takes a fair amount of planning to collect together all the ingredients, the equipment and the time taken to steam the puddings is rather longer than today's Microwave Culture are used to. I also believe the longer the pudding has to mature, the better. So I generally try and make mine in October. This recipe originated from my Grandmother - where she got it from I don't know but she did work "In Service" for a large Gloucestershire hotel and may have picked it up from there. Or it may well be a very old family traditional recipe. I really have no idea. Since I got my hands on it, the recipe has changed somewhat, for a number of reasons. A major reason, and one why I continue to make my own puddings, is that I dislike glace cherries and cut peel - both of which are almost guaranteed to be found in shop-bought puddings. Making my own means that I can include the ingredients I want and omit the ones I don't like. And it is a good enough reason for you to make your own as well and help keep this family-oriented tradition going. 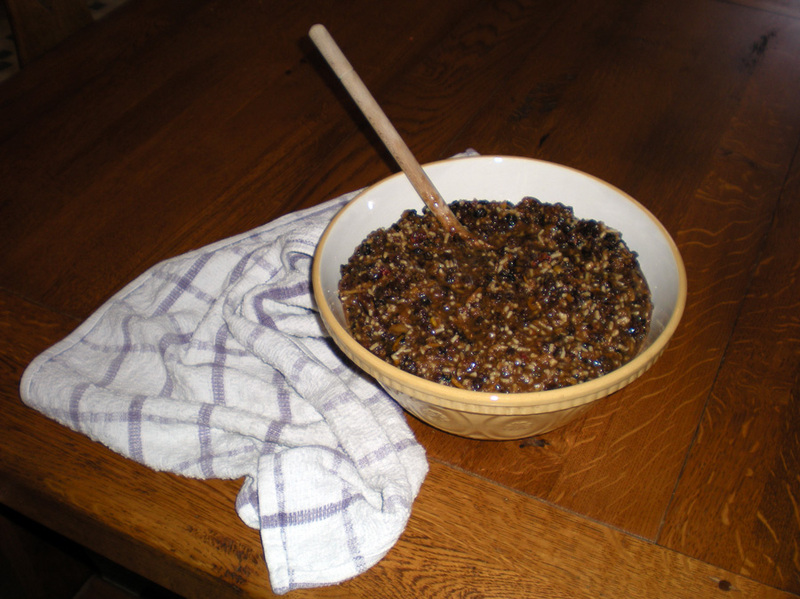 It is also a bit of a "thereabouts" recipe, where the ingredients' amounts may be qualified by "or thereabouts" Not got the right amount of currants? Or just don't like 'em? Not a problem, make up the weight with something you do like - dates, raisins, dried cherries & cranberries, whatever you can get. And so on and so forth. This recipe is very amenable to personal adaptation. As this is derived from an old recipe, I make no apologies for stating amounts in good old-fashioned pounds & ounces. If you really must translate into metric quantities, then feel free, I won't stop you. So long as I have kitchen scales that can handle either system, I don't really mind how a recipe is specified. Clicking on any of the photos will throw up a larger, more detailed picture. This recipe will make five lbs of puddings - that's one large and one medium, or five small, or one medium and three small - well, no doubt you get the general idea. 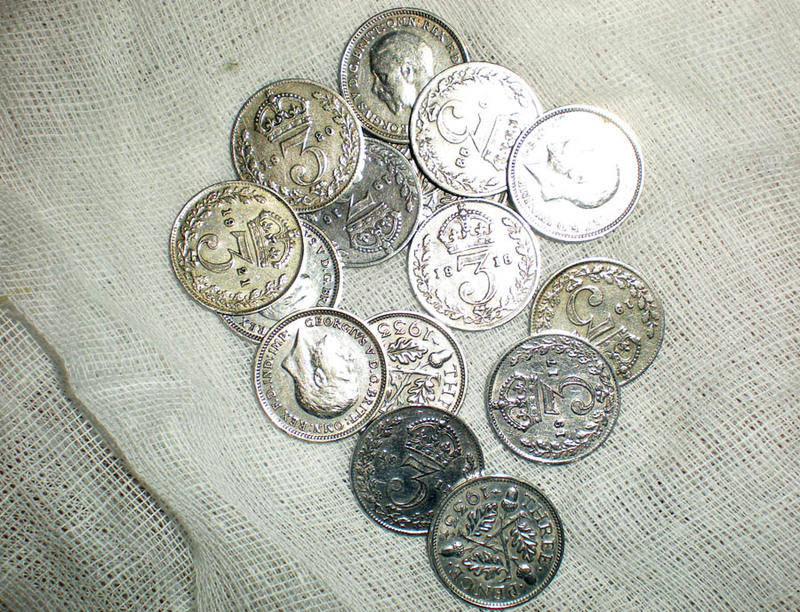 Of course, altering the amounts to make less or more is simply a case of multiplying the amounts. I've always found that the amounts here produce the bare minimum number of puddings I can get away with. It seems to be a popular product! 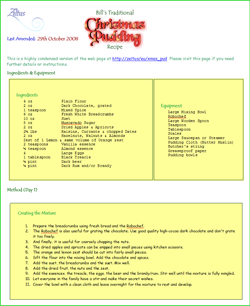 Pudding cloth is an essential part of this recipe. It really gives the pudding the correct "look" and it really helps when removing the cooked pudding from the bowl. It ought to be available from any decent kitchen shop, but I've yet to find an on-line shop that can supply it. Prepare the breadcrumbs using fresh bread and the Robochef. The Robochef is also useful for grating the chocolate. Use good quality high-cocoa dark chocolate and don't grate it too finely. And finally, it is useful for coarsely chopping the nuts. The dried apples and apricots can be snipped into small pieces using kitchen scissors. The orange and lemon zest should be cut into fairly small pieces. Sift the flour into the mixing bowl. Add the chocolate and spices. Add the suet, the breadcrumbs the suet and the sugar. Mix well. Add the dried fruit, the nuts and the zest. 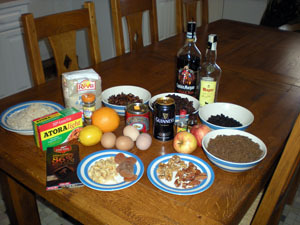 Add the essences, the treacle, the eggs, the beer and the brandy/rum. Stir well until the mixture is fully mingled. Let everyone in the family have a stir and make their secret wishes. Cover the bowl with a clean cloth and leave overnight for the mixture to rest and develop. I've already stated that this recipe is very easy to alter to cater to personal tastes. I would like to repeat this advice, with some examples here. I tend to use vegetable Suet nowadays, but only because it's easier to get than normal Beef Suet. Vegetable Suet may make the pudding slightly lighter, but not enough for me to be able to tell. If you can't get dried apples, use peeled, grated fresh apple then - and cut down on the amount of beer (i.e. fluid) used. And talking of beer, Guinness is indeed dark but a sweet Brown Ale is the best choice. Do not use lager! This quantity of chocolate will add flavour the pudding. You can always cut down on the amount used if this is undesirable. Originally, it's purpose was to help darken the pudding. Almost any nuts, except peanuts, may be used. I add Pecan nuts to my recipe when I can get them. I don't use Sultanas or Golden Raisins in my recipe. I prefer the darker fruits specified above. But I do add some exotic fruits when I can get them - I managed to obtain some sour dried cherries and dried blueberries one year, and they were a very tasty addition. I like dark rum! That, with the molasses, helps to give this pudding a rich flavour. But if you don't like it, just use all brandy instead. Butter the insides of the pudding bowls. 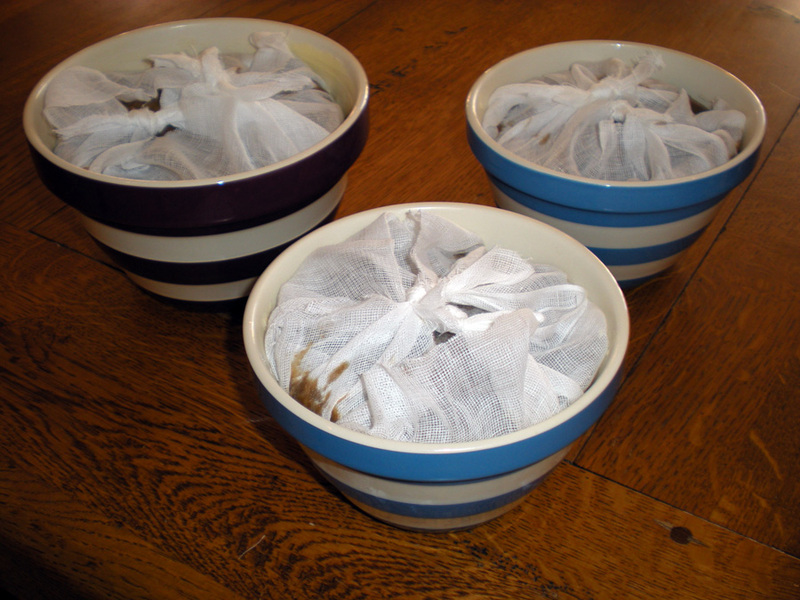 Place a large square of Pudding Cloth in the bowls. The butter helps the cloth stick to the sides of the bowl. The cloth needs to be large enough so the the diagnoal corners can be tied over the top of the pudding mixture. Spoon the mixture into the bowls, leaving a small amount of room for expansion. Cover the mixture with a circle of baking paper. Knot the cloth over the top of the pudding. Cover with a pleated piece of foil. Secure the foil with string. Ensure you create a handle at this stage. It'll be a great help when removing the cooked puddings from the steamer. Place the bowl into a large saucepan or steamer, on top of a small plate or saucer - the pudding should not have direct contact with the bottom of the saucepan. Fill up the saucepan with water to about halfway up the side of the pudding bowl. Heat up the water 'til at the boil and then reduce heat to keep at a gentle boil. Boil for 4 hours (medium pudding) to 6 hours (large pudding) topping up with HOT water throughout as necessary. Remove the pudding bowls and leave them on a trivet to cool overnight. Yes, I know - that is a very long time to cook something. But it is better to over-cook these puddings than risk under-cooking. In fact, it is almost impossible to over-cook them. Do not let the steamer boil dry! 5 A circle of baking paper is placed on top of the mixture. 6 Tie the pudding cloth over the top of the paper. 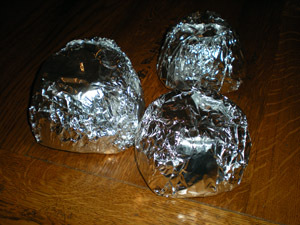 7 Tie a pleated foil cover over the pudding. Remove and discard the string and foil coverings. 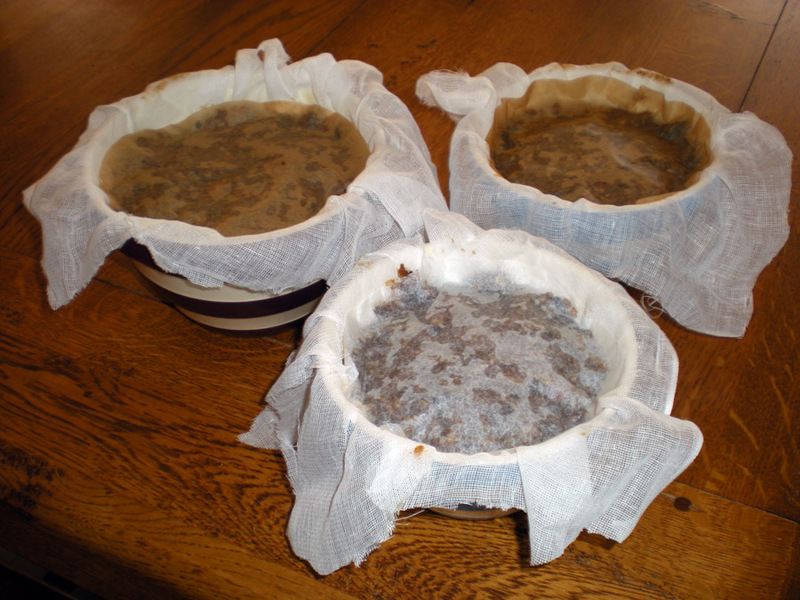 Carefully ease out the puddings - the pudding cloth really helps here! 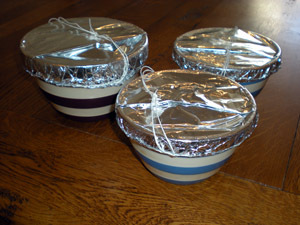 Wrap the cloth-covered puddings in foil. Store in a cool, dry place until Christmas Eve. 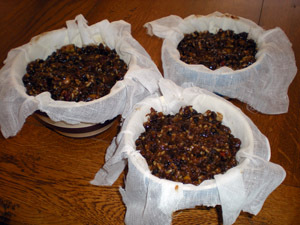 8 Remove the cooked puddings from the bowls. Take your pudding and remove it from it's foil covering. Top up the bowl with a good slug of rum and/or brandy. Secure the foil with string. Again, ensure you create a string handle. Place the pudding bowl into a large saucepan or steamer, again, just as when it was received its first steaming. 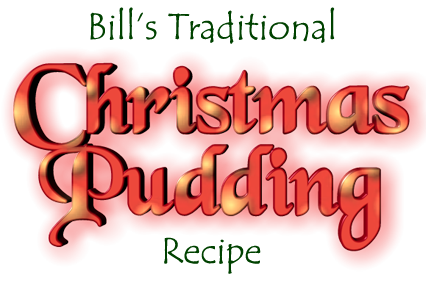 Boil for 2 hours(medium pudding) to 4 hours (large pudding) topping up with HOT water throughout as necessary. Untie the cloth knots (or cut them off) and remove the baking paper circle. Up-end the bowl onto a plate. Remove the bowl and carefully remove the cloth. Pour on a decent (two or three tablespoonfuls) quantity of warmed rum and/or brandy and ignite. Serve immediately with custard, cream, clotted cream, brandy butter or whatever else takes your fancy. Warming the rum/brandy is essential for a good flame. A few seconds (and no more than that!) in the microwave is a good way of achieving this. 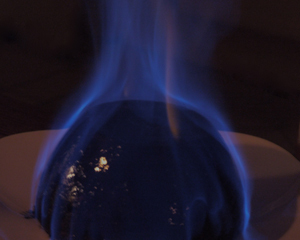 Do try to flame the pudding a the table. After all this trouble making the pudding, it would be a shame not to milk the occasion for all it's worth. You will need Adobe Reader installed and available on your computer. If necessary, click on the Adobe logo to go to to Adobe Reader download page. This is a fairly hefty download but is a once-only operation.